Fire breathing Guinness world record holder Fredrik Karlsson doing "The dragon's breath"
Fire breathing is the act of making a plume or stream of fire by creating a precise mist of fuel from the mouth over an open flame. Regardless of the precautions taken, it is always a dangerous activity, but the proper technique and the correct fuel reduces the risk of injury or death. Fire breathing is performed by both professionals and non-professionals. Professional fire breathers usually incorporate the fire performance skill within a show where other fire skills are performed. The element of danger in performing fire breathing and other fire skills enhances the entertainment spectacle for many audience members. The vast majority of professional fire-breathers are apprenticed by a seasoned professional and it is strongly recommended that teaching oneself be avoided due to the extreme risks. Most people who are taught fire breathing and eating skills are seasoned performers in their own right and are taught under the condition that the skills not be passed on until they become a recognised fire performer. Virtually all recorded incidents of serious injury by fire breathing involve untrained individuals, often while under the influence of alcohol. Using an incorrect fuel is usually a strong contributing factor. Performing with fire has many inherent risks to the health and safety of the practitioners. Fire breathing has a wider range of risks due to the required technique to create the effect. Having an actively spotting trained safety assistant with an appropriate fire blanket and fire extinguisher is an appropriate best practice when fire breathing and is a mandatory clause in most insurance policies for professional fire breathers. To increase safety, fire breathers must avoid highly combustible fuels such as alcohol, spirit-based fuels, and most petrochemicals, instead using safer combustibles with a higher flash point (>50 °C). Due to its relatively safe (≈90 °C) flash point, paraffin, or highly purified lamp oil, is the preferred fuel for fire breathing. Although corn starch has been cited as a non-toxic fuel, the hazards of inhalation increase the potential risk of lung infections. Ethanol can be absorbed into the blood stream without drinking. Thus attempting fire breathing with ethanol can cause intoxication. Methanol (used with many colored flame recipes) has a variety of entry vectors and can cause blindness or neurological disorders. Very low flash point fuels like naphtha, butane, and propane can create a condensed vapor build-up in the oral cavity leading to internal combustion, damaging the mouth or lungs. Naphtha is also quite carcinogenic, and performance careers built on using it entail a high risk of mouth cancer. There is a risk of self ignition while performing fire breathing. Enhanced risk comes from the use of lower flash point fuels, inappropriate fabrics in clothing (such as polyester), wearing other flammable items or products (such as hairspray), poor technique and performance in unsuitable locations. Fire breathing has been utilized in many bands of varying genres as an eye-catching spectacle. Gene Simmons of the rock band Kiss would often include fire-breathing in the band's live shows. The MC Bat Commander, lead singer of the California comedy rock/New Wave/ska band The Aquabats, would regularly breathe fire to start off the band's shows during the late 1990s and early 2000s. Mike Odd, the vocalist for the shock rock/horror metal band Rosemary's Billygoat, included fire breathing in the band's many outlandish stunts, alongside other forms of small-scale pyrotechnics. The world record for the number of people simultaneously fire breathing was set on 23 April 2009 by 293 students in the Dutch city of Maastricht as part of the Ragweek charity event. In August 2007 the record for the biggest fire breathing pass was set at the Burning Man festival in the Black Rock Desert, Nevada; a single breath was passed to 21 people before the flame went out. The world record for the highest flame is 8.05 m (26 ft 5 in), set by Antonio Restivo at a warehouse in Las Vegas, Nevada, USA, on 11 January 2011. The most consecutive fire flames blown by one mouthful of fuel (without refuelling) is 387, achieved by Tobias Buschick (Germany) in Neuenbürg, Germany, on 1 August 2015. The most flames blown in one minute is 189 (with refuelling) and was achieved by Zhu Jiangao (China) on the set of CCTV - Guinness World Records Special in Jiangyin, Jiangsu, China on 9 January 2015. ^ Pele "Fire Breathing", 2002. Retrieved on 2010-10-18. ^ NAFAA "NAFAA Performer Safety Guidelines. (Revision 2.1)", 2010-7-5. Retrieved on 2010-10-18. ^ I. Weinberg and Z. G. Fridlender "Exogenous lipoid pneumonia caused by paraffin in an amateur fire breather -- Weinburg and Fridlender 60 (3): 234", Occupational Medicine, 2010-3-22. Retrieved on 2010-8-22. ^ "Aquabats and Mealticket to return for Ska Patrick's Day fest in Provo". Deseret News. 14 March 1997. ^ Distefano, Alex (21 November 2013). "Top 10 Shock Rock Bands of All Time". OC Weekly. ^ "Most people fire breathing". guinnessworldrecords.com. Retrieved 7 April 2011. ^ "Fire breathing". Webster's online dictionary. Archived from the original on 20 May 2013. Retrieved 7 April 2011. ^ "Highest flame blown by a fire breather". guinnessworldrecords.com. Retrieved 7 April 2011. 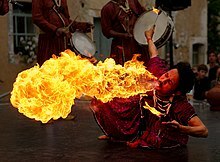 Wikimedia Commons has media related to Fire breathing.